Engrave It Houston — Custom Laser Engraving?... yes, we do that! Custom Laser Engraving?... yes, we do that! No matter what you have.... a special present for a friend, a watch for your husband, or even a whole stack of ipads for your company employees, we can engrave just about anything. We also have very knowlegable design staff on hand that can help you make it look just right. They can help you choose the right font or they can create something completely unique for you! Thinking about adding your company logo? No problem. They can handle that too. We really enjoy working directly with the customer to come up with one of a kind (or a few more) pieces. If you've got an idea and you've been putting it off or if you got a brand new amazing, multitasking, shiny, tech-y device planned for a gift for Christmas... contact us. 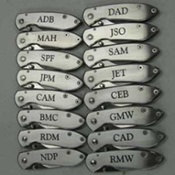 We'd be happy to help you with the engraving!